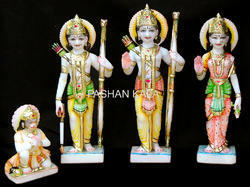 Lifelike Ram Darbar God Statues can be purchased from us. These are made with artistic excellence and passion, which is adequately displayed in its exquisite quality. Our range is carved out of pure marble, which is sturdy and royal. Moreover, These White Marble Ram Darbar Idol are demanded throughout the country and can be found in temple in far flung areas as well. 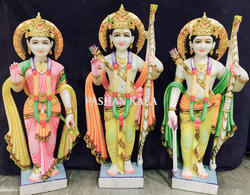 We put forth for our client a wide assortment of premium quality range of Ram Darbar Statue Colorful. Carved out by our skilled craftsmen, these are made using high grade raw material to ensure their compliance with international quality standard. These Lord Ram Darbar have got to feature optimum quality and smooth surface that make these to stand highly popular among our global client. Clients can avail these in several size, pose and finish and at market leading price. 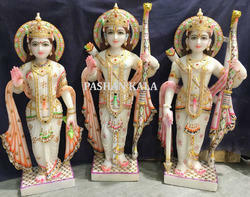 Our organization holds expertise in offering an distinguished assortment of Marble Ramdar Parivar Murti. Crafted by skilled craftsmen by utilizing qualitative marble, this statue reflects the true workmanship. Owing to features like high aesthetic appeal, lively appearance, gleaming look and smooth edges, this statue is considered as exceptional and outstanding. Further, this is available in variety of finishes, sizes and patterns. Clients can avail this high quality statue at pocket friendly prices..
One can avail from us an aesthetically designed White Marble Ram Darbar Statue. Creatively crafted Ram Darbar Statue reflects the skills and creativity of traditional craftsmen. According to Hindu Mythology, Ram Darbar is considered as goddess of patience, fearlessness and power. 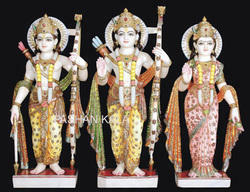 Client can avail the offered Marble Ram Darbar Statue at market leading price within stipulated time frame. We are manufacturer and exporter of an exclusive collection of White Makrana Marble Ram Darbar. These statue depicts Lord Ram with his wife goddess Sita and brother Laxman. Furthermore, our statue are ideal for placing in marble temples. The ornaments and accessories of our statue is crafted by our expert that make it more colorful and attractive and is available in most affordable price. 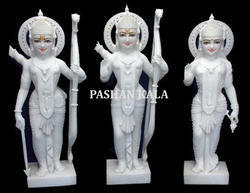 Spiritually uplifting White Marble Ram Darbar God Statue are being offered by us. These can be availed in lifelike size as well as smaller figurines. 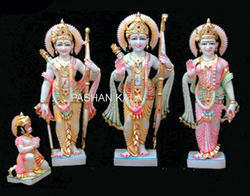 Our statue reveal the simplicity and purity of the deities in the Ramayana. The offered statue are known for excellent appearance, perfect color combination, beautiful design and exclusive artistic work. Highly renowned Marble Ram Darbar Statue with Das Hanuman are being offered by us in exquisite finish. The qualitative stone used in their carving is reliably procured from dependable source. Moreover, the artisan working on our Ram Darbar possess the right knowledge to bestow superior standard to our statue. We are able to present our clients a wide range of Stone Marble Ram Parivar. The offered product is made under the supervision of expert craftsmen, who use pure marble. Moreover, we work in confirmation to set industrial specified norms, so that we can ensure complete satisfaction to our clients. Apart from this, the offered product is available to the clients in competitive rates. 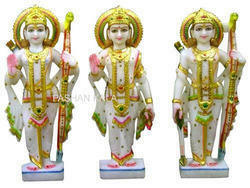 Our assortment of Ram Darbar Statue is offered at cost effective prices. Standing in blessing gestures, the idols of hindu deity ram, sita, laxman and hanuman are skilfully carved out by our craftsmen and sculptors with special attention to the minute details. Marble Ram Darbar makes different size, pattern and color. We are expertise in this field of work of manufacturing, supplying and exporting a wide range of Gods and goddesses statues and murtis. This array of high quality exclusive statues also include one of the most respected i.e. Lord Ram Darbar Idol is the emblem of knowledge and intellect and hence are demanded by several families, temples and places of pilgrim. 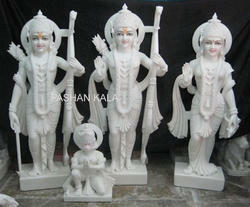 These Marble Ram Darbar statues are made of white marble which adds up extra decor to its beauty. 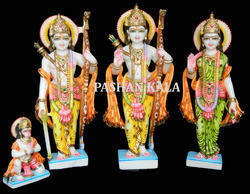 These Ram Parivar Murti are availed by us to our clients at a very desirable range of prices. 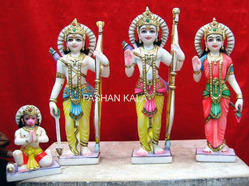 Looking for Marble Ram Darbar Statue ?